This week marks the three year anniversary of our introduction of The What To Do When You’re No Longer Here Program™. I’ve had the extremely sad, yet proud opportunity to witness the program being used on multiple occasions since we introduced it, including twice this year with long term Relaxing Retirement members’ families. The reaction from each of the spouses and their families was the same. Losing their father was so hard, but the process of getting their affairs in order was a snap because of all the preparation that they did using The What To Do When You’re No Longer Here Program™. While we had a hand in creating the program, each of the deceased members took the time to “use it”, i.e. they filled out each section where their input was called for so it was ready when needed to be put into action. The end result was their families were not burdened in any way. In contrast, the process was extremely reassuring, and made each of the kids so proud of all that their parents had accomplished. Have you used the program and done your homework so your family isn’t left wondering where everything is and what your priorities were for them? Attorney, financial advisor, insurance agent, or CPA? What funeral arrangements had been made? What you want in your obituary? If you have a will or trust? If you have life insurance? The combination to your fireproof safe? The keys to your safe deposit box at the bank? Passwords to files on your computer? What bills to pay to stay current and maintain good credit? Which insurance bills to pay and which to stop paying? How to handle their income taxes? If something tragically happened to you tonight, and you were no longer here to guide them, would your family be able to answer all of these questions? If you said “no”, you’re not alone. Dedicate an hour this weekend, just one hour, to writing out your answer to these questions for your family. Now, I fully recognize that you won’t wake up tomorrow morning and say, "Let me see, this weekend I can relax with my family, go to that party, read a book, watch the game, clean the garage, or write out a set of instructions for my heirs when I pass away! Hmmm, what do I want to do first?" We’re all in the same boat. I understand. At the same time, however, your family deserves better. Just take a little bit of time to write it all down and share it with them. As difficult as this may be to do given the scope and underlying purpose of this project, try to put yourself in the shoes of your heirs for a moment. Try to picture them anxiously attempting to carry out your wishes, but without your presence to guide them. Assume they don’t know anything that you know. Because of this, I recommend being as thorough and clear as you can. 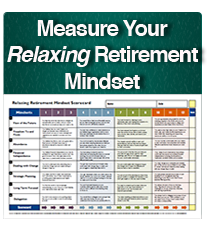 Obviously, if you’re a Relaxing Retirement member, you already have The What To Do When I’m No Longer Here Program™ in your possession which comes with a “Checklist” referencing specific pieces of information you’ll provide to your heirs. However, even without that checklist, you can get started by simply answering the questions posted above. Do it RIGHT NOW! Your family will never be able to thank you enough.